Home » History » Women's Suffrage » Happy Birthday Victoria! Victoria Claflin Woodhull, later Victoria Woodhull Martin (September 23, 1838 – June 9, 1927), was an American leader of the woman's suffrage movement. Woodhull was an advocate of free love, by which she meant the freedom to marry, divorce, and bear children without government interference. She was the first woman to start a weekly newspaper and an activist for women's rights and labor reforms. In 1872, she was the first female candidate for President of the United States. 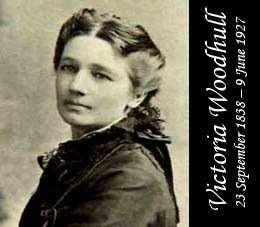 Woodhull went from rags to riches twice, her first fortune being made on the road as a highly successful magnetic healer before she joined the spiritualist movement in the 1870s. While authorship of many of her articles is disputed (many of her speeches on these topics were collaborations between Woodhull, her backers, and her second husband Colonel James Blood), her role as a representative of these movements was powerful. Together with her sister, she was the first woman to operate a brokerage firm on Wall Street, and they were the first women to found a newspaper, Woodhull & Claflin's Weekly.